A well thought out landscape lighting design extends the seasonal use of your outdoor environment. Lighting your garden at night means that, as the days grow shorter, you won’t have to decrease the amount of time you spend outside. And, the temperate climate we enjoy in Northern Virginia makes it comfortable to be outdoors most of the year anyway. 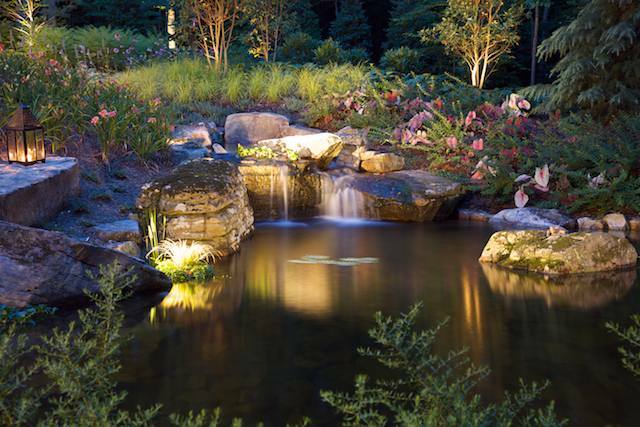 In terms of aesthetics, outdoor lighting can showcase some of the most attractive landscape features after dark. In fact, certain details of your garden become apparent only after dark. For example, lighting trees from below can show off beautiful structure, particularly in fall or winter after leaves have fallen. The garden is a different place at night. It sounds different. It certainly looks different. Think about what it feels like to be outside on a moonlit evening. The moonlight naturally creates dramatic shadows, halos and highlights around tree crowns and other foliage. Artful landscape lighting can give that same sense of “wow” on any night you choose. Some trees look better lit when there are no leaves on them. Japanese maples reveal their beautiful structure when the leaves drop. They can be too bushy otherwise. We approach lighting objects of interest (trees, sculpture, architectural details) differently than we do pathways or sitting areas. We look for best view, the best angle. We try to hide the lighting instruments or mask them with foliage so that the eye is directed to the subject of the lighting rather than the lighting instrument itself. We are in a sense sculpting with light. We also use lighting to guide us through the landscape. So a good garden lighting plan must account for changing elevations on the property. This can be tricky depending on the slope of a property. For example: If you are at the bottom of a path looking up, you might see the underside of a path light depending on its placement. You don’t want to have light beaming into your eyes as you try to find your way up the steps. We’ve learned to walk our pathways to anticipate those issues. Sometimes we can mask a lamp from below with foliage or a landscape feature. Or, we may choose a different type fixture that is lower to the ground and below the eye line. Lights recessed into the ground at the base of a tree illuminate it from the ground up to show off its shape and trunk structure. This is a theatrical lighting effect. Lamps fixed high in a tree cast light downward through branches and foliage. It can be used to throw dramatic shadow patterns onto a patio below. Moving water, when lit by submerged instruments, creates an especially flashy effect almost like fire. The lights pick up the splash pattern of a fountain or waterfall and cast flickering patterns on nearby foliage or objects. It shouldn’t be. Most landscape lamps are low wattage halogen in the 10 or 20-watt range unless you need to spotlight a tall tree. And technology in landscape lighting is changing every year. LEDs are becoming the norm. A 30W equivalent LED lamp only draws 3 watts and last much longer. So the energy conservation is improving all the time. There are also improvements in the equipment. One of the most persistent problems with garden lighting systems is voltage drop and water intrusion. In standard systems wire is twisted around wire nuts at junction points. This causes voltage drop sometimes and is a weak spot where water can enter. There are some new systems on the market that promise to make this problem a thing of the past. The first thing to discuss with your landscape architect is how you intend to use your outdoor spaces. What sorts of options will you need to set the mood for a quiet evening at home, a family gathering, a pool party? But keep simple. Develop a garden lighting plan that will enhance your night garden experience without drawing attention to itself. If you need help with design or maintenance of a landscape lighting system, feel free to contact Surrounds and speak with one of our Garden Management Specialists.